Last week, Aaron and I finalized our amicable divorce. I know that I am incredibly lucky to have gotten through the process as easily as we did, but it was still a difficult and painful thing to do. When I was preparing myself for this journey, I searched around for articles on amicable divorce. I was looking for information on common pitfalls or advice. What I found was mostly not useful or not applicable to our situation. It seemed that amicable divorce was either viewed as a fallacy (I disagree) or framed around what the children needed (we have none). What follows here is my experience with amicable divorce, shared in the hopes it reaches someone in a similar situation who would appreciate a point of view from someone who’s “been there.” This is the first in what I hope will be a series of posts covering different aspects of my divorce, since it is difficult to capture with a single entry. In January, Aaron received news of a potential out-of-state job offer that caused us to ask some hard questions about our relationship. We knew things were not as we would like them to be, but staring down the possibility of partial or full relocation made us look at our situation more closely. We quickly realized that, while we were accustomed to and worked well as teammates in life, we had not been partners for quite some time. Shortly after this discussion, Aaron and I began an in-house separation. I needed things to be more real, to feel what it was like to live as individuals (as much as we could while under one roof). I hoped that it would give me (us) a clear answer as to whether “uncoupling” was the right decision. I removed my wedding rings around the same time, though I put them back on for several events prior to making our decision public. It was a strange time, especially because I initially felt very calm about the changes. So much so that Aaron was a bit thrown by it – I’m passionate and stubborn and have fought for our relationship on many occasions before. To hear me simply say “OK, it’s over.” was startling. I will admit that, at first, we weren’t very good at living “separately.” While our sleeping arrangements and physical relationship was that of friends or roommates, we were still checking in with each other during the day, making grocery lists, and taking turns making dinner. The only major change, besides me sleeping in the guest room, was that we both felt more free to make our own plans. Aside from coordinating on dog care, we could both put as much time into our hobbies or socializing as we wanted to without depending on the input or approval of the other. Even then, we still did occasional things together including a cross country weekend for a family member’s 40th birthday. But then we reached a moment when it became apparent that we needed to separate ourselves more fully from each other. We’d carpooled in to Portland for a concert. We didn’t hang out at the venue, but when it was over we rode home together. I won’t get into the details, but hurtful things were said and it was painfully obvious that trying to buddy up and rideshare was no longer a healthy choice for us. Aside from the comments made, I felt a new pang from the loss of my concert companion. Music was a large part of our relationship and something that had brought us together at times when we were feeling the distance between us. Concert stubs take up the most space in my little box of relationship mementos, a tribute to our united love of music. One of the hardest pieces for me was that, even though we lived together, I was alone. Sometimes I felt it more keenly than others. One statement I found when I was searching for divorce articles was the fact that your (ex) husband can no longer be your “go to” guy. It felt like a punch in the gut to read that. I’d thought that since we were amicable, I’d still have his help for certain things. But I realized that, while he may still help me at times, I cannot count on him like I once did. As we moved closer to our court date I had to remind myself not to depend on him for things that have been a given for so long. Even asking for a comforting hug during a tough day was stretching the boundaries of where we needed to be. Even though I consider myself a fairly independent person, I’d underestimated how accustomed I was to sharing my everyday life and thoughts with someone. Sharing two meals a day, texting each other small stories or questions during the day, talking about work and watching TV in the evenings. Once we became more truly “separated” – all of those things went away. Our breakfasts are sometimes shared by proximity and texting is limited to handling the logistics of our slightly more complicated life. As teammates, Aaron and I tended to make very logical, logistical choices. Our wedding was a quasi-elopement held in our backyard so that we’d have more money available to fix up our first house. When we moved to Maine, we lived with my parents for seven months while we were house shopping so that renting would not eat into our down payment funds. We never took real vacations because our time off was spent visiting family and our money was invested in keeping our house in good condition. What this meant for our divorce is that we continued to live as separated long after we knew that things were over. Neither of us thought it was wise to sink money into living in different locations before things were final. In fact, we agreed in our negotiations that I could continue to stay in the house past our divorce – until October 1st or when I find a house, whichever came first. And given the current state of the local real estate market, it’s likely that I’ll be here until October 1st. Or whenever living together becomes harder for me than moving back in with my parents, if it comes to that. 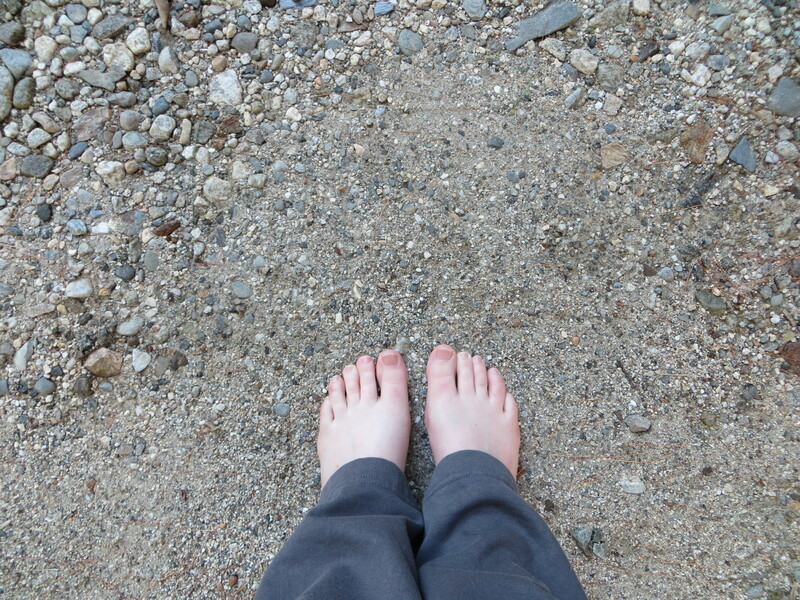 On Facebook, I have an album of photos called “First Feet.” Shortly after moving to Maine, I realize that we were doing things we’d never done before. It just so happened a sunset walk on the beach was the first time I thought of documenting it. I took a photo of our feet side by side in the sand. The next activity was bowling, which lent itself perfectly to a foot photo. And so I started setting up our feet for a photo whenever we tried something new. Visiting a farmer’s market, dipping our toes in the St. Lawrence, on the ski lift, etc. As our divorce drew nearer, I thought that a “final” photo would make sense – our feet at court, facing away from each other. When I asked Aaron for this, he did not agree. He wasn’t comfortable documenting our departure that way. Which only served to emphasize that he is no longer the same teammate he once was. My silly symbolism is no longer relevant to “our” relationship. As I step out on to this new path, I chose to take a photo that is more fitting for the road ahead. It won’t be easy and the way is unclear, but I will wind my way through. I am not certain of the next destination, but I will arrive there a wiser, fuller version of myself thanks to my time with Aaron and my time without him.